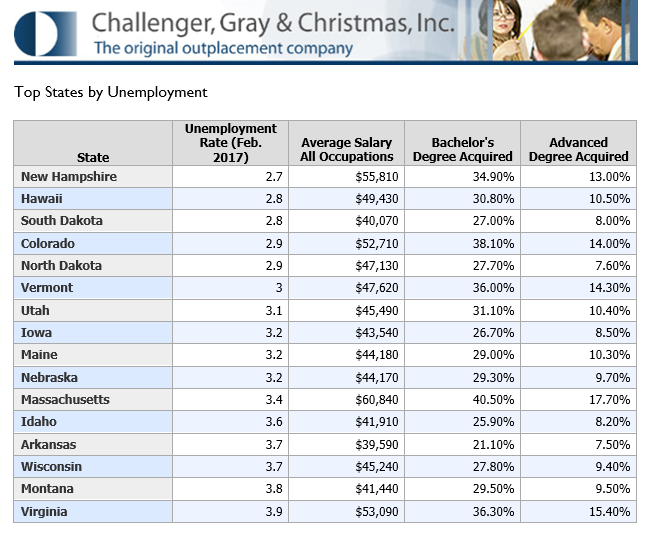 Relocation Rate Steady: Best Places for Job Seekers | Challenger, Gray & Christmas, Inc. Although the national unemployment rate fell slightly in March to 4.5 percent from 4.7, some areas fall well below and well above this average, indicating varying degrees of economic strength. “Job seekers have more options than they did during and immediately after the Great Recession. While many do not necessarily have to move for work, just over 10.23 percent of job seekers relocated for new positions in the first quarter. Job seekers would be wise to research local job markets to see where the greatest opportunities might be,” said John Challenger, CEO of Challenger, Gray & Christmas, Inc. Indeed, relocation rates hovered near 11 percent in 2015 and 2016 on average. Recent relocation rates are down from a four-quarter average of 13 percent in 2014 and 2013. Relocation reached a post-recession high in the second half of 2014, as 15 percent of job seekers pulled up stakes for new opportunities during the final two quarters of the year. “Before determining where job seekers should look to relocate, it is important to look at why companies are flocking to certain cities. Companies look for several things when it comes to a desirable location for an office – an educated workforce, a cheap cost of business, tax incentives, and business friendly policies,” said Challenger. Metropolitan areas with large business-presence like New York and Los Angeles are indeed booming. Both cities have an unemployment rate on-par with the national average. “However, costs are high, not only to live in these places, but also to do business. The states of New York and California both have an average salary of over $50,000 per year and that number increases in the city. Many employers are increasingly likely to move to smaller cities where they can still attract young millennial talent, but also save money,” said Challenger. Cities like Provo, UT, Salt Lake City, UT, and Denver, CO that are relatively cheap and full of young, educated Millennials are particularly attractive, according to Forbes Best Places for Business and Careers list. They also have the lowest unemployment rate of cities with 1 million people or more, according to the Bureau of Labor Statistics: Salt Lake City and Denver each had an unemployment rate of 3.2 percent in February. 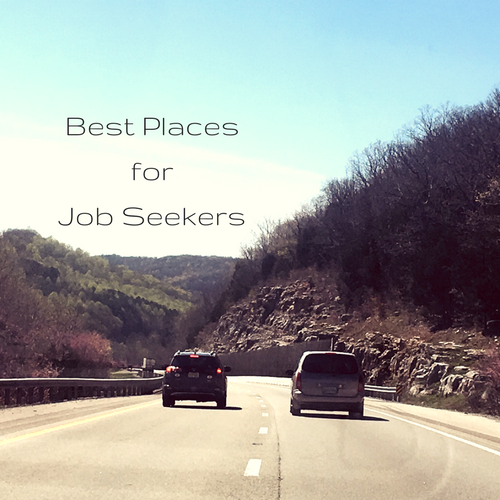 A few areas stand out as particularly good for job seekers. Utah is becoming a hub for business, with several large technology companies establishing headquarters in the state according to a July 2016 article by Adweek. 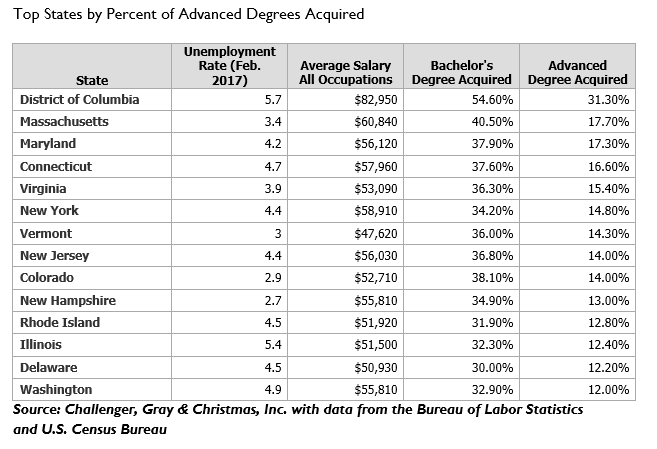 Utah has a 3.1 state unemployment rate, as well as one of the higher rates for bachelor degree and advanced degree earners. Much like Utah, Denver also is experiencing a growth in company investment and technology firms. According to Forbes, firms like Partners Group are noticing the talent and the high quality of life in this area and are deciding to create more jobs in Colorado. It is also an attractive state for job seekers. Colorado is ranked fourth in unemployment rate with 2.9 percent and an average salary of over $52,000. As baby boomers start to retire at a more rapid pace, they tend to move to the Southern, warmer states, which is opening up opportunities for hospitality and tourism growth in southern areas. In particular, Florida, Nevada, and Arizona are seeing job growth in these sectors according to Forbes 10 Best States for Future Growth. “Particularly workers in the health care sector, including RNs, physical therapists, and elder care specialists should track trends in Boomer migration. Health care is always a solid area for growth, and workers in this specialty can typically find work in any location,” said Challenger. Not only is it important for job seekers to look at trends for job growth, it is also important for them to notice what kinds of jobs are popping up in each area. While Florida is having an increase in jobs, according to Business Insider, many of these jobs are in the low to mid wage range, meaning they pay less than $21.14 per hour using the metrics provided in the same article. Tech hubs and major metropolitan areas still seem to hold the highest share of highest paying jobs, but smaller cities like Denver and Seattle still manage to make the top ten list.